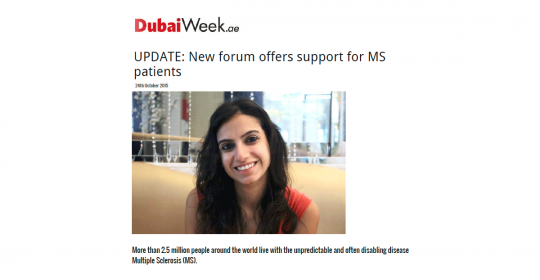 DubaiWeek, 24th October 2015, Link, More than 2.5 million people around the world live with the unpredictable and often disabling disease Multiple Sclerosis (MS). It’s not clear how many Multiple Sclerosis patients there are in Dubai, but one woman wants to help people, like her, who have been diagnosed with the disease. 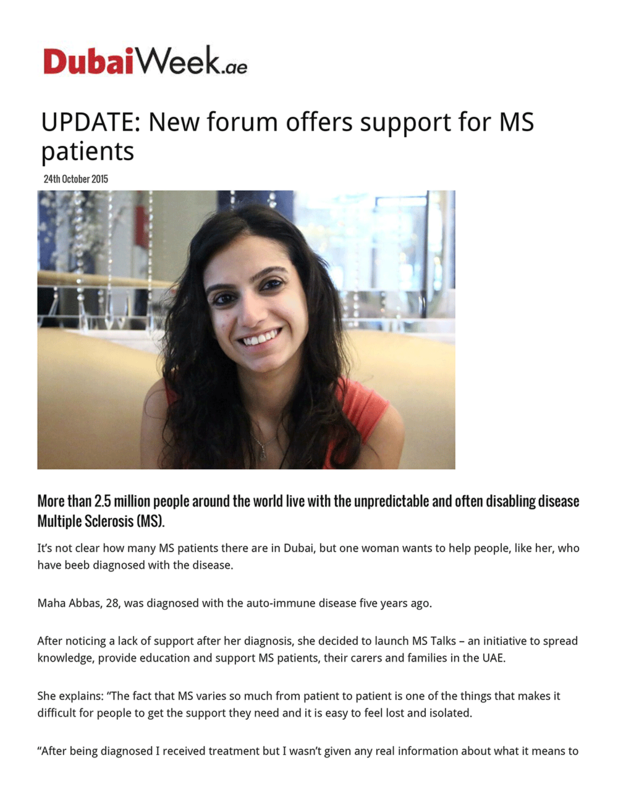 Maha Abbas, 28, was diagnosed with the auto-immune disease five years ago.After noticing a lack of support after her diagnosis, she decided to launch MS Talks – an initiative to spread knowledge, provide education and support MS patients, their carers and families in the UAE. She explains: “The fact that Multiple Sclerosis varies so much from patient to patient is one of the things that makes it difficult for people to get the support they need and it is easy to feel lost and isolated. “After being diagnosed I received treatment but I wasn’t given any real information about what it means to live with the condition, the different options available to me, or ways I could adapt my lifestyle for a better quality of life. “This is something I want to address so we can open up a better dialogue and help people learn more about what their body needs in order to cope with Multiple Sclerosis in the best way possible. Maha will be hosting an inaugural MS Talks forum, supported by the German Neuroscience Center, on Saturday 31st October between 5pm-10pm at Urban Bistro in Dubai Media City. People can share their stores and find out more about the different types, symptoms and treatments of the disease. Neurologists from the German Neuroscience Center will also provide a doctors’ corner where patients can seek professional advice. The event is free of charge. To register interest email interestedmstalks@gmail.com. • MS is the most widespread disabling neurological condition amongst young adults around the world. • The majority diagnosed between the ages of 20 and 40 and women are twice as likely to be affected as men. • Studies show Dubai should be considered as one of the regions with medium to high risk for MS, which is an auto-immune disease that affects the central nervous system, attacking nerve cells in the brain and spinal cord. • There are different types of MS and researchers still don’t fully understand the causes or progression and the disease varies greatly amongst sufferers. • Symptoms can include fatigue, reduced activity, vision problems, numbness, tingling, dizziness and muscle weakness.